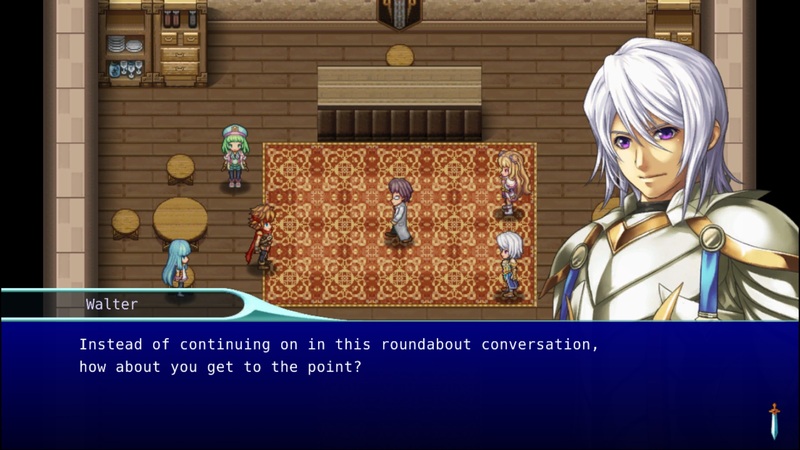 Kemco’s JRPG library has been growing strong for more than a decade now and several of their initial titles have been developed into their own series. Alphadia Genesis is a spin-off of the original Alphadia collection of games, taking place in a similar world and timeline, while also serving as a nice entry point for gamers new to the series. 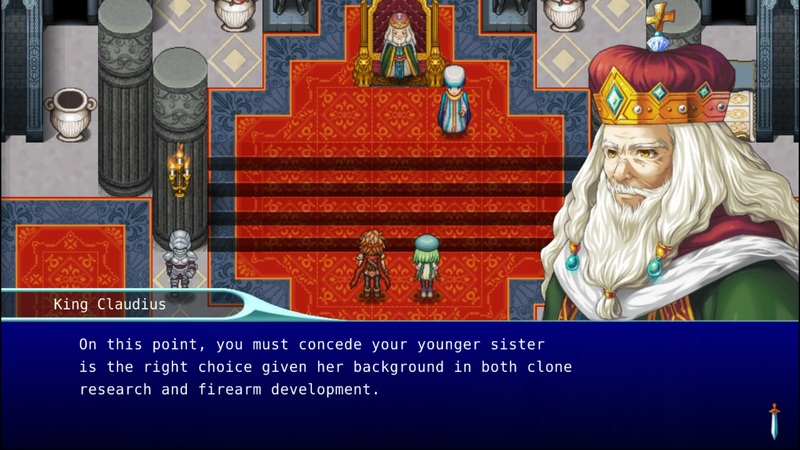 With this spin-off comes an attempt to integrate new ideas into Kemco’s old school style. Traditional turn-based gaming, classic JRPG narrative, and a few twists along the way, this definitely feels like another Kemco effort, but whether there’s enough here for it to stand out amongst other Kemco JRPGs is the real question. Alphadia Genesis takes place in a high fantasy world in which a globally devastating event, called the Energi War, has finally concluded and peace has prevailed for fifteen years. One of the main aspects of the Energi War was the use of clones in combat. Engineered to take orders from their assigned masters, yet possessing cognition, compassion, and the ability to express free will, clones have been the subject of much post-war debate in regards to their rights and place in society. Our story begins when a strange incident occurs, in which an owner’s clones disobeyed orders to protect and instead murdered him. Our heroes Fray, his sister Aurra, and the clone Enah, from the Archleign Kingdom, are assigned to a joint investigation team with Corone and Walter, of the Ghalzabine Empire, to find out how this incident occurred and how possible it would ultimately be for a clone uprising to ignite throughout the world. Alphadia Genesis’s story is a fairly straightforward ordeal with just enough intrigue and mystery to keep us playing. Fray and his crew will travel the world as they unravel the causes of clones attacking innocent civilians, how they can potentially stop these attacks altogether, and also begin repairing the damage done to clone-human relations. The major reveals and the personal struggles are amusing enough to hold our interest, but there is a noticeable lack of detail. Many of these reveals are haphazardly thrown in your face and are over as soon as they’re introduced. The overall plot focuses on the notion that an ongoing argument for and against clones having freedom is present, but it doesn’t actually go into the arguments themselves. We are only given the fact that there exists this argument. While the arguments for are obvious, with the direct connections between consciousness, personality, and free will, the one point against that we get is that clones may or may not have this capability to attack whenever they want. Even the fact that clones are manufactured versus born is never really discussed. It’s a shame that the plot ultimately ends up framing the argument instead of fleshing it out, especially with the golden opportunities to delve into two incredibly complex and controversial subjects in society; human cloning and free will. But instead of arguing the points for and against clones having the same rights of free will as humans, the subject is mostly unaddressed. We’re only given the bare minimum, in that some people are for clones having the same human rights and some are not. That’s it. How can you leave us with so little and so many questions unanswered? These are huge themes that, if given proper depth and detail, would have made the story so much more fascinating. The narrative elements of the story fair better than the plot, as we get to see a degree of character development, humor, and personal growth throughout the campaign. The narrative itself is mostly dialogue between characters and the scripts for these are fairly strong. There is just enough distinction in syntax and diction to properly individualize characters. The English translation is pretty strong too, but there are several references to Western media and culture I could have done without, as they don’t fit the medieval fantasy setting. As for the conversations between characters, they range from serious to lighthearted and are full of emotion. The budding relationship between Fray and Corone is noteworthy, as we see Corone’s joy as she realizes her feelings and her anxiousness when trying to share these feelings with Fray. We see Walter’s pure disdain for Fray, fueled by his superiority complex and jealousy for Fray being chosen by Corone over him. I especially like Aurra’s character, with her brash, straightforward style that pairs adorably with her cute, younger-sister personality; she’s not afraid to speak her mind and almost enjoys the trouble she gets herself and others into when joking, speaking, or acting openly. But while Aurra’s character sees this wonderful range of traits, others tend to feel one-dimensional and instead fit a common mold. Walter is the typical brooding support character, Fray is a typical good guy that wants to do the right thing always because that’s what heroes do. Enah is the blank slate that’s supposed to fill in as she experiences more of the world with her companions, but doesn’t ever really grow out of the quiet, yet resolute mold. And then there’s Grande, a loud father figure that, while showing the compassion and ability to read situations as a mature parental figure would, never demonstrates other personal traits or sides of himself. While I’ll easily remember Aurra for her depth and development, the others are unfortunately a little too bland and unmemorable for my taste. 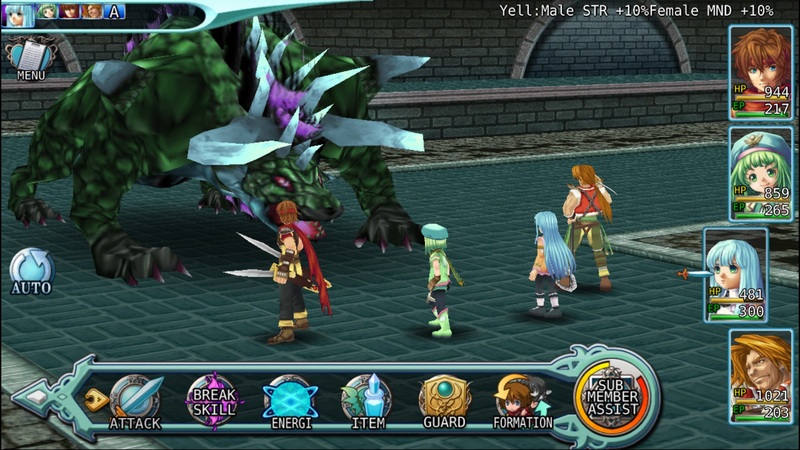 As for its gameplay, Alphadia Genesis is mostly a familiar endeavor for a turn-based RPG. Combat driven, the classic, traditional approach to this game works well and is easy to master. Basic attacks, Break (physical) and Energi (magical) special skills, leveling, swapping arms and armor, everything you would expect from the genre is here. While Break skills are unique to every character, Energi skill sets are the same for all characters. During combat, ally positioning coming into play, as you can arrange four of your six allies in the vanguard and rearguard, or front and back. Members sitting out of battle are called sub members and each character has a bonus effect, called a yell, for the battle party when sitting. The combination of two sub members will yield an additional effect, such as additional EXP gain or even higher stat boosts. Also during battle, a sub member assist gauge fills as attacks are landed and hits are taken. When full, each sub member will unleash one random skill along with the ally that initiated the attack, potentially unleashing major damage and/or buffing the party. Another unique trait to combat is elemental affinity. 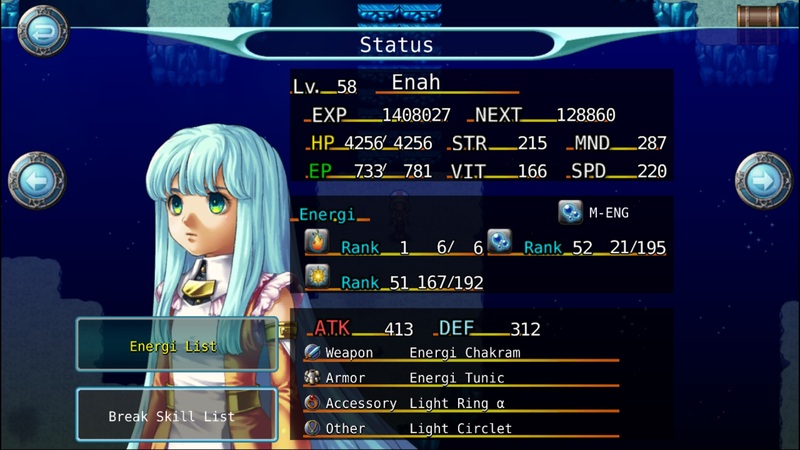 Similar to the elemental component in Asdivine Hearts, each character will learn the Energi skills associated with their own elemental affinity, which are fire, water, and light. A character can then equip special elemental rings that will allow them to learn an additional affinity’s skills. I enjoyed this, as you’ll need to decide early what additional affinity, and ultimately which additional set of Energi skills, each character will learn. While combat is tight and the system is well built, it feels too familiar and has trouble standing out amongst other RPGs. There just isn’t enough notable innovation and uniqueness with its gameplay alone. Another issue I have is the lack of labels for certain stat buffs and debuffs. When you use a buff/debuff affecting attack, defense, mind, and/or speed, it just shows the affect value and an arrow pointing up or down, for buff and debuff. Although this is addressed in later Kemco games by including labels with those arrows, here, for example, you may not know what buffs enemies use or what debuffs are launched against your team. Lastly, the game uses a number of abbreviations that go unexplained. I usually praise the Help menu and in-game tutorials and, for the most part, they are still quite useful here. However, abbreviations that explain how Break and Energi attacks will target allies and enemies are never explained. So, it’s up to players to figure out that EV stands for enemy vanguard, EC is enemy column, 1E is a single enemy, etc. Fortunately, before confirming a Break or Energi skill, the affected targets flash, so that helps figuring out a skill’s behavior. Outside of combat, the game progresses by completing the main quest line with a number of sub quests thrown in. The game has excellent length, but the overused formula of visiting a town and then a nearby dungeon is ever present and while it may seem familiar and a bit dull, it’s a good thing the intrigue of the story helps to nicely mask this overly simplistic and linear way of moving along. The sub quests don’t fare well, though, as they all require defeating a specific number of enemies or collecting enemy drops and the rewards don’t tend to be worth the effort. Outside of questing, there is an arena that yields decent items and unique equipment, but none are necessary to complete the game. Finally, there is both a normal ending and true ending. Similar to other games, the true ending opens after the normal ending and provides additional quests and sub quests. While it feels like more of the same gameplay-wise, especially with the already tedious dungeon layouts and lack of a mini-map, the additional content, mainly the new plot points, is still appreciated. The one gameplay aspect I do applaud the most is the absence of a difficulty spike. I specifically bring this up because this has become a somewhat common practice for Kemco. It hints at a play-to-win scheme and while some games, like Revenant Saga and Antiquia Lost, have in-game ways around it, this game in particular does not suffer any kind of difficulty spike that requires the use of special equipment. Now while there is a special points system and special shops like in those other games, the use of AGP (Alphadia Genesis Points) and special shops is never required. I’m assuming this is because Alphadia Genesis is one of Kemco’s earlier titles, so the dishonest idea of forcing the use of special shops and enticing in-game purchases hadn’t yet corrupted the developers. 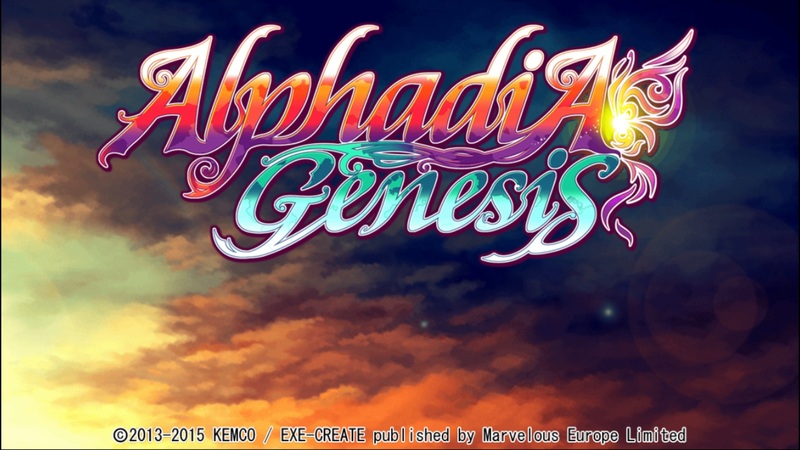 As for the aesthetics, Alphadia Genesis continues the ongoing tradition of a mixed bagged effort by EXE Create. Visually, the game uses both 2D and 3D styles to bring its world to life. The 2D efforts comprise of the same strong 16/32 bit artistry seen in other games and remains a praiseworthy point. I especially like the portrait work for dialogue, as it’s very impressive and detailed. The slight changes to eyes, brows, and mouths invariably help emotional expression and I’m glad to see this practice continue. I also like how many of the support characters also receive the portrait treatment, as more exemplary artwork is always better. Even the extra effort to have mouth movements when characters are speaking is appreciated. While not incredibly complex, those extra touches are always welcome. 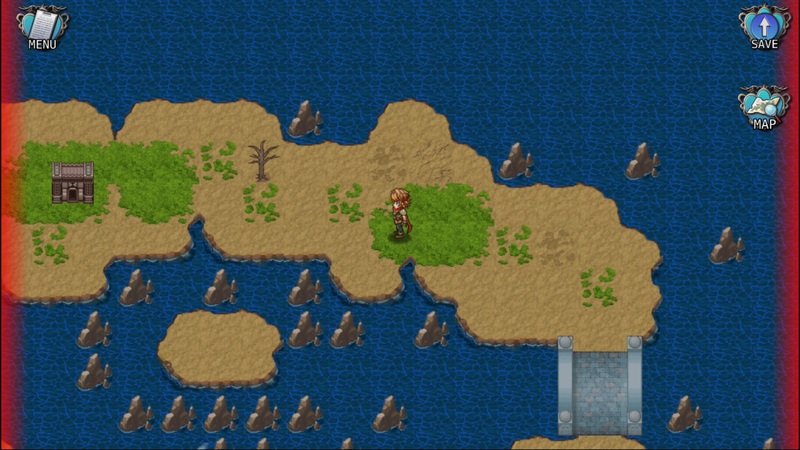 The 3D effort, however, is reminiscent of Revenant Saga’s, in that it needs help. The models don’t look terrible, but definitely give the game a dated look and feel. While they may be acceptable on mobile platforms, the transition to PC didn’t do the 3D work any favors. Again, because this is one of Kemco’s earlier efforts, I’m willing to give it a pass, but only because it doesn’t greatly deter from the overall experience. In regards to the audio, the aspect I find most impressive is the voice acting. Although not fully voiced, many of the most crucial lines of dialogue have accompanied voicing. It really helps convey emotion and provide immersiveness to the narrative, along with stressing the importance of these select lines. Also, voice bits for each character are provided for combat and the simple battle cries and grunts help flesh out the characters. It’s a common practice in the genre, but it can go a long way to bringing characters to life, as we get to hear how they sound and how they react to a multitude of situations. As impressive and appreciative I am for the voicing, I can’t say the same for the music score. I feel like a broken record when saying this, but the sound score is nothing special. There are too few tracks, many of which are overused by the time endgame rolls around, and they don’t help to embellish the tones and moods established by the story. Like in the other games, the sound score is mostly just there in lieu of silence. Overall, Alphadia Genesis will provide a satisfying JRPG experience, with just enough story intrigue, compelling character interactions, a strong, yet overly familiar gameplay mechanic, and satisfying 2D visuals. Despite its missteps, fans of the JRPG genre and those intrigued by the Alphadia series can be assured that this will serve as an excellent stand-alone adventure, a worthy addition to the series, and a solid starting point for all newcomers.